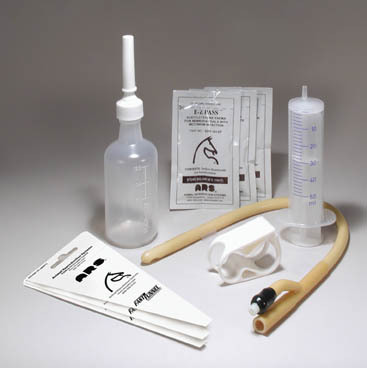 E-Z Pass Enema Kit is an Acetylcysteine Enema designed for use in newborn foals with meconium impaction. The mucolytic properties of Acetylcysteine make this product highly effective in providing relief to newborn foals. The E-Z Pass Enema Kit includes all materials and supplies required, and is completely disposable. Studies have shown that up to three applications may be necessary for successful treatment of meconium impaction. The E-Z Pass Enema kit includes three packets (treatment doses) in case repeated administration is required. The E-Z Pass Enema packets can also be purchased in bulk as individual packets for veterinarians and large farms who wish to provide their own supplies. This enema should be used under the advice and recommendation of a veterinarian.